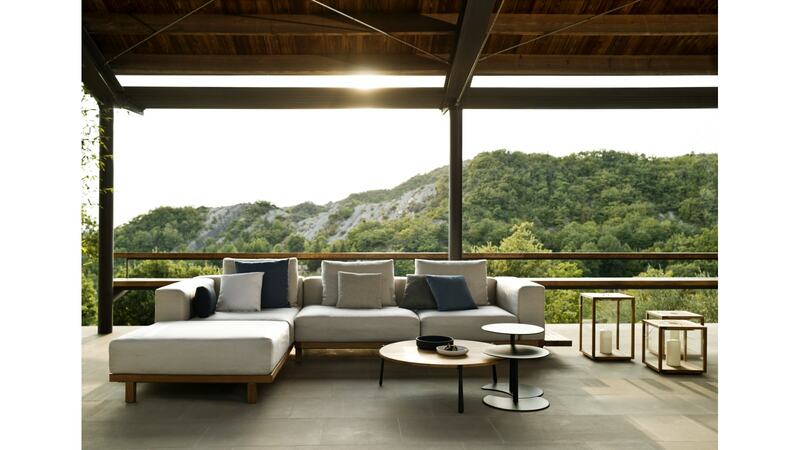 The Vis à vis sofa is an outdoor lounge sofa that brings an ode to pure design. A slender, teak platform supports comfortable outdoor cushions without any visible back or arm structure. The cushions are supported by brackets in stainless steel which means that the sofa looks great from whichever way you look at it. Moreover, you can attach a graphic border or practical tables to the platform. The outdoor cushions can be left outside, even when it’s raining, thanks to the ventilating stuffing in a waterproof cover. The Vis à Vis sofa offers a modular construction system in which endless compositions are possible, from a small meridienne sofa to a large corner sofa with side tables. This range comprises of many different modular options. Please enquire for pricing.